Happy Monday! I can’t believe that Thanksgiving is already this Thursday. I feel like this year has gone by so fast. There have definitely been a lot of ups and a lot of downs and I’m excited for a fresh start in 2018… and for the launch of my online store! Anyways, I wanted to share the coziest thermal with you, again, (that I wore last week in white) in this beautiful wine color. As soon as I ordered it, I knew I wanted to wear it with white jeans and a leopard scarf. This wine thermal is a great alternative to a black or white thermal because it’s still a deep enough hue to not be too “out there” so you can dress it up or down as a neutral super easily. I paired it with a leopard scarf, which I’ve had since last year, that is still in stock this year! 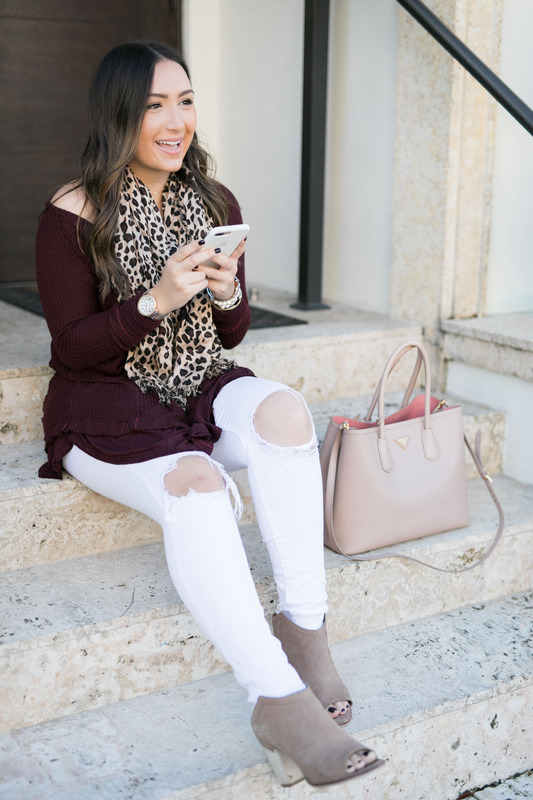 It’s one of my favorite accessories and is an easy pop of print when you don’t know what to wear. I’ve worn it with a white top and jeans, dresses, every combo you can think of. And it’s so soft, too! Perfect for Miami or warmer winters because it’s not that thick at all. It’s also only $30 so would make a great gift! It’s also a perfect outfit for Thanksgiving day, if you ask me. This is the most beautiful thermal I have ever seen! I love that you paired with white jeans. It’s the perfect look for fall! k, I need this thermal in every color! That is the perfect top! I love the color. This entire look is so chic! I am loving the color of that top! Beautiful! 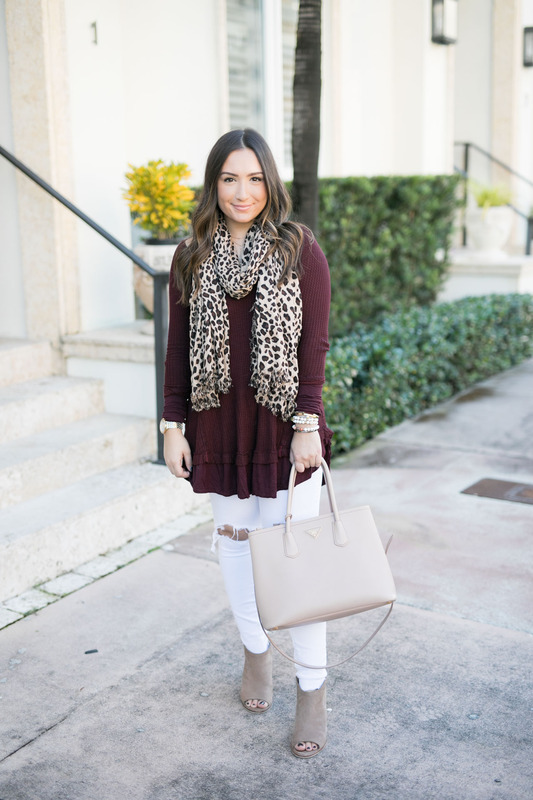 Burgundy and leopard are a match made in heaven! LOVE! you’re a beauty! love this look & obsessed with that bag! This is such a cute top! I love the burgundy color! That thermal is so cute and I absolutely love it in this color!! This outfit is perfect! Perfect color for fall. I love the leopard print touch! I love all the trends you put together! Looks great! This is so cute, I looove that scarf with the burgundy! So gorgeous! I love the cute detail on this thermal top! You styled this perfectly!